Glossy, thick and sweet, it is a delicacy in its own right. Our Invecchiato Balsamic Vinegar DOP was voted amongst the Top 50 Luxury Foods by The Independent. Made from the must of Trebbiano grapes, this Traditional Balsamic Vinegar is left to age in small barrels made from different kinds of wood for at least 12 years. It has DOP certification, which means that it has been approved by a panel of five expert tasters who are part of the Consortium of Balsamic Vinegar Producers of Modena. 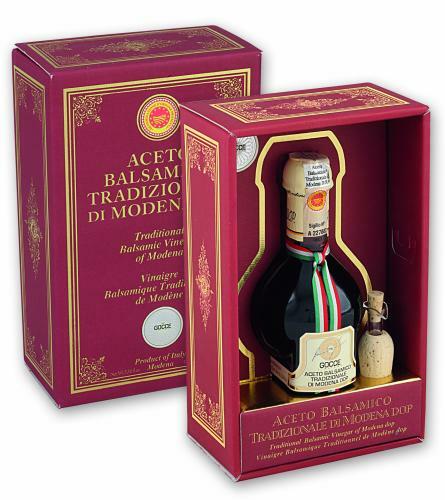 Traditional Balsamic Vinegar from Modena is only sold in a wax-sealed, bulb-shaped 100ml bottle with unique identifying numbers and DOP on the label. Storage: Store in a cupboard or kitchen.